Diary Gonder: Nothing in the world can prepare you for your reception in Gonder. You! You! You! You! You! You! You! You! You! You! Mister! Mister! Baby! (directed at the kids. Luckily we didn’t really need to stop to find the place where we’re camping, but still ended up pursued by a horde of children who seem to be just as fast as the LR at this altitude (2200metres) The shock to the system is complete after the polite and reserved Sudanese. It becomes very difficult to go out with the kids as they attract a huge amount of attention and are rapidly surrounded in a feranji (foreigner) frenzy of mounting choruses of You! You! and Baby! Baby! Boy this is culture shock! 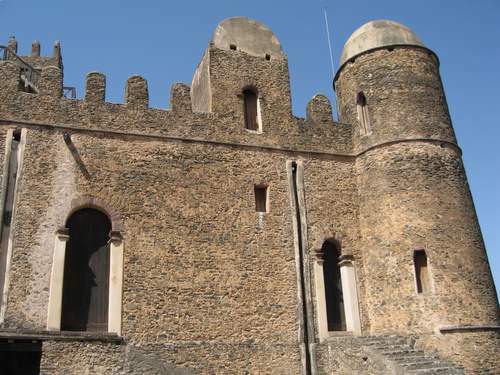 However, Gonder is probably worth the effort as has many interesting castles and churches as it was the capital of Ethiopia for 200 years from 1667.